After the passing of 72 hours following the start of yet another one of London Underground’s hotly disputed tube strikes last week, things gradually returned to normal (i.e. ‘minor delays’) as the city’s commuters began their journeys to work on Thursday morning. Standing on the tube as everyone nearly almost always does — eyes glazed over, plugged into an iPod, or pretending to read a book in order to avoid eye-contact while sandwiched between fellow sweaty passengers — one can’t avoid looking up once in a while to stare fruitlessly at the often under-appreciated TFL Tube map strategically located above the windows behind those who are seated. Known to be one of the most popular British design icons, it’s been made into posters (based on Simon Patterson’s renowned piece The Great Bear), outfitted mugs and other novelty souvenirs, as well as being located on the back of every London A-Z and most other city guides. But what is it that makes the Tube map so special, especially considering that it only bears a marginal resemblance to what the map ought to look like had it been drawn in correlation with the actual geographical layout of the rapid transit railsystem? To start, the first diagrammatic map of the Underground was designed back in 1933 by Harry Beck, an Underground employee who decided to base it on the topology of the railway rather than the physical locations of the stations (hence the aforementioned discrepancy). The approach used is commonly found in electrical circuit diagrams, though it is believed by some that Beck based his diagram on the mapping for underground sewage systems. 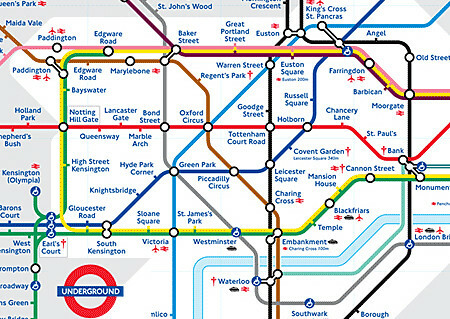 It subsequently became rapidly popular, and though numerous modifications have been made since (most notably by the 1960s Underground publicity officer Harold Hutchinson, and Paul Garbutt, as well as on the account of progressive development and expansion of the railway network), the Underground has continued to use the topological map to illustrate the network to this very day. In technical terms, the Tube map is a schematic diagram that represents the lines, stations and zones of London’s underground railsystem. This is categorized in the use and practice of information graphics (or infographics): visual representations of information, data or knowledge. Used anywhere where the aformentioned components need to be disseminated and explained in as quick and simple a way as possible, such graphics can be found in the form of signs and maps, as well as in technical writing, journalism and educational materials. Applied in various aspects of scientific visualization, they are also used as tools by computer scientists, statisticians and mathematicians to aid in the process of developing and communicating conceptual information that may otherwise need more rigor to consume and process visually, aurally, and cognitively as a consequence. And seeing as there is a long history of such practice dating back several millennia, one can be sure this technique, especially in a globalized environment in which pictographs can function as an international visual or picture language, will not soon go out of fashion. One fine example of this can be seen in the music video for the 2002 hit ‘Remind Me’. Entirely comprised of animated infographics (shown above), its title track was the first single from the acclaimed Norwegian duo Röyksopp‘s debut album Melody A.M.. Featuring ‘Someone Else’s Radio Mix’ in place of the original release (all vocals by Erlend Øye, of Kings of Convenience), the directing team from the Paris-based motion and graphic design studio H5 (Machine Molle‘s Ludovic Houplain, Antoine Bardou-Jacquet, Hervé de Crécy et al.) portray a day in the life of a woman working in London’s ‘Square Mile’, incorporating a medley of labelled close-ups of everyday objects, product lifecycles, schematic diagrams, charts, and general illustration in a simple isometric visual style. Here, the technique of infographics is evident: specialised forms of depiction representing content in sophisticated and often abstract ways, allowing the viewer to interpret the meaning of these graphics appropriately if they have a suitable level of graphicacy (sufficient learned comprehension skills, the skills of decoding individual graphic signs and symbols, in addition to knowledge of the conventions for distributing and arranging these individual components in order to enable the building of understanding). But perhaps even more importantly, such a schematic breakdown of the leading character’s ‘workday’ instills a sense of monotony and dreary automation, almost to the extent of pitiful yet forcedly happy ‘lifelessness’. Each frame is characterized by a face of irony, perhaps even to the extent of teasing the City work lifestyle in light humour as it breaks the basics down to an even more basic level. And thus the coming together of a very scientific, visual portrayal of processes in the artistic format of a music video revolving around a mundane 24-hour period proves to be extremely effective: not only does it become visually interesting, but it sends a deeper message across that goes beyond mere ‘information’. Also by H5 and in a similar fashion is the 2004 television commercial for the French public multinational industrial and energy conglomerate Areva (below). Using animated infographics with the addition of cel-shaded animation, it features music by Lipps Inc., ‘Funky Town’, and has since attracted a parody to counter the advertisement and highlight the dangers of nuclear energy instead.